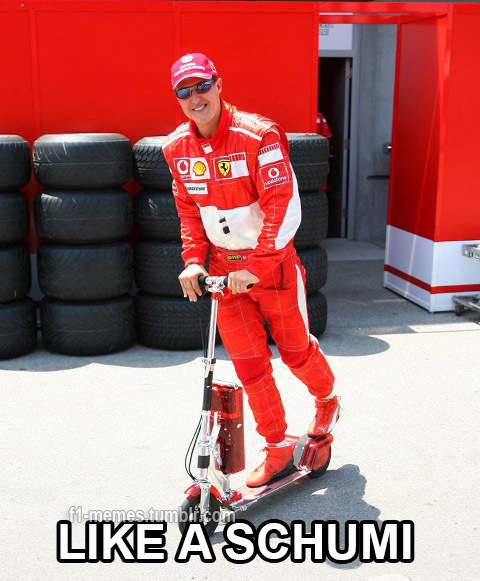 forza schumi – Bouncebackability Rules. To be perfectly honest, this piece wasn’t particularly easy for me to write. However, I felt that I should at least make a decent attempt at it, for the sake of having my convoluted thoughts put on record for whatever purpose it may serve. It’s been nearly eight months since that fateful day in Switzerland, and apart from some musings on Twitter, I’ve deliberately avoided writing about Michael Schumacher’s accident here on my blog for quite a number of reasons. It was a blow of epic proportions to my heart. I still literally feel physical pain at the mere thought of that accident. I didn’t want to write about him in uncertain terms. Reading tributes and heartfelt get-well messages have been helpful but they were but a temporary salve to my shattered heart that was desperately struggling to fight fear. I swore to myself that I would only open up about it once something positive came up. Amidst the sea of panic and instability, I chose not to read the damning articles prophesizing the worst, and the influx of negativity that came with them. Schumacher fans have subsequently been called ignorant, in denial, naive, and other worse things, but I simply did not care. Wallowing in alarm and speculation won’t do any good. I needed to step back and prioritize. To quote one of my favourite shows, The X Files: I want to believe. So, why do we choose to believe? Why do I choose to believe? Faith, while it may come as easy as breathing, is also something that is difficult to explain. Faith is laying your heart on the line and trusting that you will become a far stronger person no matter what the outcome may be. Faith, at times, defies logic. Faith is that valuable, intangible something that you hold on to. Where there is love and hope, there is faith. Call it The Secret, positive affirmation, claiming it, or whatever, but as a true-blue, ride-or-die Michael Schumacher fan, I simply refuse to roll over and give up when the going gets tough. As one of his most famous quotes go, “I’ve always believed you should never give up. 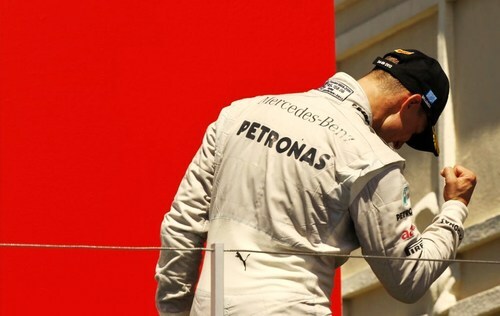 You should always keep fighting even when there’s only a small chance.” Amen, Schumi. We all have different coping mechanisms in times of trouble. Mine is to meditate and to pray. I talked and begged and badgered God and all the saints that would listen. I want him to get better. I need him to get better. Please. If I could somehow transport all of my positive energy towards him just to make him wake up and recover, I would’ve done so in a blink of an eye. Believe me, I’ve tried. This wasn’t just for my own selfish agenda, I am just one of the millions of fans who want nothing more than to hear something positive about a man who, in his own way, has inspired, influenced, and changed their lives. Finally, it happened. A few days after my birthday, I found out through Twitter that Schumi has come out of his coma and has been discharged from the Grenoble hospital. Call it dramatic or even cheesy, but I couldn’t help but shed tears at that moment. I was too overwhelmed by joy and gratitude, and I thought that it was the best birthday gift that I got this year, full stop. I wish I could put this more eloquently, but that moment was proof that the world is full of miracles, and we need to celebrate them as much as possible. While a part of me is eager to know more about his current state and progress, a bigger part of me is content to let Michael and his family have the privacy that they’ve valued and wanted for so long. If no news implies good news, then so be it. And without an iota of doubt in my heart, I believe that Michael Schumacher—the legendary racer, the son, the brother, the husband, the father, the friend, the man—has already won the fight. Everything else will just be a bonus. That, is the power of faith.